This July marked 30 years since the opening of London’s Docklands Light Railway (DLR). As we celebrate the history of this railway to date, we look at the key involvement of Thales in making this success a reality and the example that the DLR sets for the rest of London’s transport network. Launched in 1987, the DLR was created to connect London’s Docklands area to the rest of the city. Initially covering eight miles of ground, with fifteen stations, the line connected to Stratford, Tower Gateway and Island Gardens. Although its initial capacity was less than it is today, the automated service greatly increased passenger traffic to the Docklands, with only a single member of staff required on each train for any assistance and emergencies. The DLR received considerable investment as it expanded over the years to reach additional locations such as Bank, Lewisham and Woolwich Arsenal. The line now visits 45 stations, has tripled in length to cover 24 miles of track and carries an annual total of 122 million passengers. The DLR is an example of an autonomous railway delivering benefits not only to passengers, but to operators and London as a whole. Reliable and secure, passengers consistently have positive journey experiences as they visit places, such as the ExCeL centre, that were inaccessible or non-existent beforehand. Through increasing capacity and reducing costs, operators benefit by having a more effective service that transports greater numbers of passengers. Additionally, and arguably the greatest benefit to autonomous railways, the technology greatly complements the priorities of London over the coming years. Sadiq Khan, Mayor of London, states in his manifesto that he aims to ‘make travel greener’ and, with his commitment to reducing London’s CO2 emissions by 60% by 2025, his plans to achieve this reinforce his statement. With Sadiq Khan prioritising the environment, transport and housing for the rapidly growing population, a more capable and cost-effective railway infrastructure will be vital to London. Through developing London’s infrastructure and by encouraging the use of a modernised public transport system, autonomous trains will continue to have crucial advantages as London advances towards becoming a ‘low-carbon beacon’. Thales’s technology has formed a key part of the DLR’s history and has been in service on the line since 1994. 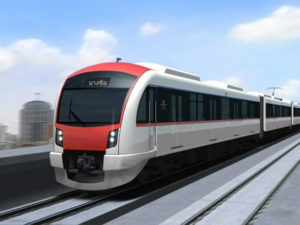 Known as the SelTrac signalling system, the service uses communications-based train control (CBTC) to operate trains without the need for a driver. In addition to the installation of this service, 2007 saw Thales teams in the UK and Canada upgrade the system’s technology to enable a three, rather than two, car service on the DLR. These upgrades resulted in a 50 per cent capacity increase, a significant improvement for the railway line. In addition to installing its SelTrac signalling system, Thales has also made significant upgrades to the vehicle control centre (VCC) at Beckton. Installing third generation VCC technology in Beckton in 2011, Thales’s work on the DLR helped greatly towards the success of the London Olympics and was also the first operational 3GVCC installed in the world. Carrying double the amount of passengers than usual, the DLR was able to effectively handle an enormous surge in traffic as passengers travelled to the global sporting event. SelTrac CBTC performed successfully during the event, supporting a record-breaking number of passengers. Additionally, following Thales’s upgrades to the signalling technology, the Jubilee line performed exceptionally well during the Olympics, being described as ‘the star of the show’. With Beckton’s upgrade to third generation technology proving successful, 2014 saw plans established to make similar changes at Poplar control centre. Updating technology that had previously been used for twenty-five years, the upgrade was a significant advancement that has contributed to the further success of the DLR. In combination with the SelTrac CBTC system, these developments have provided safe, reliable, short headway between trains to enable greater capacity on the line, whilst greatly reducing operating and maintenance costs. Since their involvement in the DLR, Thales has been co-located in the same buildings as the DLR team. This has provided the opportunity to work very closely over the years and is part of the experience that forms their expertise in London railways. Thales is a trusted partner for developing the future of London transport. FOR ALL THE LATEST INFORMATION, NEWS, IMAGES, VIDEOS AND DOCUMENTS FROM THALES PLEASE CLICK HERE.